No. 31 Kopenhagener Straße has been many things in its past lives. For architects Adam Odgers and Deborah Nickles it was a project that laid the foundation for their joint architecture practice NOa.berlin and inspired them to create their own home. After designing various iterations of the same space in the building for clients, their home became a confident playground for shelved ideas. It’s an extreme take on open plan—a doorless space where curved partitions guide the eye and peek-a-boo cutouts join rooms. Light filters throughout from a single wall of windows framing a vast cross-section of train tracks, a uniquely expansive view for a city dwelling. Today, Adam and Deborah head their business from this compact and consciously malleable home and office they built themselves. Can you tell us about the history of the building? Adam: This was originally a salt factory built around 1900. We’re sort of right where the wall used to be. In fact, when Germany was divided there was an elevator tower on top of this building that was supposedly used as a Stasi lookout. They made it look like it was an elevator equipment room but it was actually positioned perfectly to monitor the Bornholmer crossing. It was commercial from then on until it was converted into living spaces in 2010-11. The owners specifically looked for people who wanted to buy and live here, not just investors. We were originally only supposed to make the floor plans, but we ended up designing apartments in the building. How did you end up living here yourselves? Adam: It hadn’t even occurred to us that we would live in this building or buy a property at all. This space we’re in now was the last one on sale. At first, we didn’t think we could manage it but after figuring out the whole banking and mortgage system in Germany, we were able to put the finances together and— we bought it! What attracted you to the space as architects and future owners? Debbie: It’s harder and harder to find an empty space in central Berlin where you can do what you want. When we checked out the market there was nothing else out there like this. Adam: This view is also one of the major highlights. It’s rare being really close to the city center but also being able to have this kind of open space in front of your building. And, because of the train tracks, it will probably never get built on so we can sort of be sure this space will remain open. Did your work on the other apartments in the building inform the design of your own space? Adam: Definitely. It was an especially motivating factor for us because we’d actually completed three similarly shaped apartments upstairs, but they all look completely different. There were some ideas that we’d tried to pull off in the other flats, ideas that were a little ‘out there’ that we then tried out here in our own space such as the raised bathtub. We decided not to build all the rooms we wanted but spend a bit more on the materials and fittings instead. You work together from home in a space that doesn’t have any doors or full walls. What’s it like as a couple to be sharing constantly? Adam: Right now there’s no acoustically separate place in here, which is definitely becoming an issue, a year and a half into living here. We think it would be cool to close off a section of the apartment or find an office somewhere else—it will happen in time, we’re just not quite there yet. Deborah: That would be nice. It doesn’t bother me to share my private and work time here. Sometimes it becomes a problem because Adam makes music so it’s difficult for me to have a quiet moment. As for him, he doesn’t want to bother me, so then there’s no making music! Is it hard to switch off from your workday when your office and home space is the same? Deborah: Yes. But, in the end architecture is really ‘thinking’ work, so even if you have an office it doesn’t ‘stay’ there, so I’m fine with it. What’s different about working on homes rather than commercial buildings? Deborah: I like to work with people who are really concerned about what we’re building and not just the budget. Money is always a question, but it’s just not just about that. Adam: And in the end, I guess all architects would say this, you feel some sort of possession over the project you’re doing but ultimately it belongs to someone else. Perhaps the ideas are yours but you have to get used to detaching yourself. You have to look at it another way—if we did our job well they feel really comfortable, they feel like it’s theirs, like they’ve got total possession of it. Do you think that all the spaces you’ve designed in this building say something about the clients? Adam: Oh yeah, it’s almost a literal picture. Adam: One thing we’ve had floating around in our minds is to somehow document the work we’ve done in this building. It might be interesting for other people to see all these different versions of the same space. Is it strange to see the clients you worked with in the building, do you bump into each other a lot? Deborah: Actually we have quite a close relationship with them, they’re mostly around our age and ninety percent of them also work from home, so we meet all the time. In the beginning, when we thought about buying this place, it was like, ‘Hmm living with all of our clients, no way.’ We were afraid of getting calls all the time saying, ‘This isn’t working and that’s not working,’ but no, it’s fine, it’s more like friendly ‘neighborhood assistance’. Adam: One thing we found is when you work with people on their personal spaces it’s kind of impossible not to get close to them, in a way it’s just really private. There’s this weird personal connection you make with them. I guess you are creating the space they spend the majority of their time in. We have gotten some good friends out of that which probably doesn’t happen so often. We got some good luck in this building, I guess. Thanks, Adam and Deborah for shedding some light on your very personal build. See more of their work as NOa.berlin. 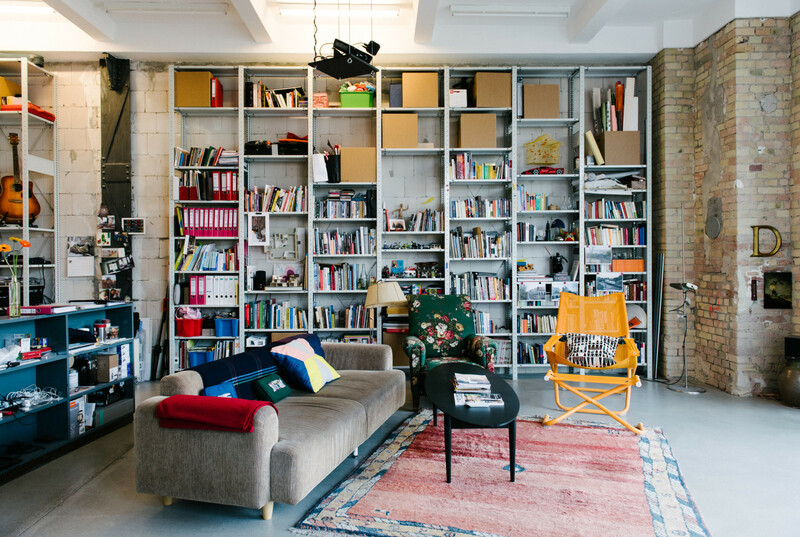 Browse through our stories in our hometown, Berlin, and visit our architecture archive.